This smart, chic urban cycling helmet is made by one of the most respected names in helmet construction, the Italian company MET and with an rrp of £50 this could be the perfect helmet for your ride to work. Don’t fancy looking like a Lycra clad speed merchant? Prefer an understated helmet over a vent filled, carbon formed, featherweight £150+ offering? The Camaleonte is a combination of road helmet and urban bmx/skater style lid and it works well. Bringing together ventilation and urban design this helmet fits like a glove but is light enough so you wont notice it. The inner pads offer support and raise the protective layer and shell off the head enough to allow a good amount of airflow to keep the head cool. The Camaleonte from MET comes in three colours, white, black and this fetching green/blue that I have had on test. To be honest, I normally wear a Giro Prolight or Met SineThesis so this was a bit of a departure for me and I would have felt more comfortable in either the white or black helmets but this is what MET sent so this is what gets tested. Riding a carbon road bike to work in this helmet does draw a few looks but surprisingly not ones of derision, I got nods of approval but I didn’t spend too long reading meanings into these. My other bike option, a Kona HeiHei Supreme was no more fitting for this helmet but if I had a hybrid, tourer or fixed then I would no doubt look the part. The helmet fitted more comfortably than my road bike helmets which was a surprise but one I was happy to handle. If anyone has been watching the recent road races on Eurosport in which Team Sky have been participating you may have seen their Kask helmets, the Camaleonte doesn’t look too dis-similar, especially when seen in black. 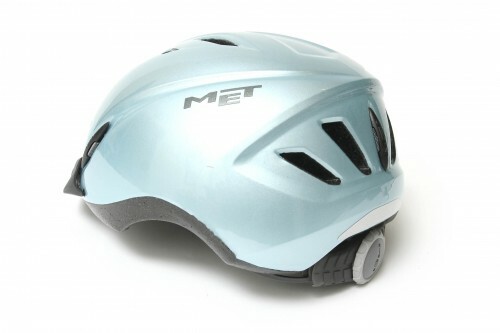 With high quality, tried and tested MET technology taken from the top end road and trail helmets such as ‘in moulding’ shell construction to keep weight and bulk down. The helmet also has a reflective tab at the back to add some extra visibility for those winter commutes and a removable visor helps keep the rain and dirt out. The helmet liner pads are removable and washable to make sure no smells build up and the helmet has a long lifespan. All in all though, this helmet looks the business, especially in a commuter, fixie style. Coming in at 254g for a medium and a shade under £40 online this is a weight and wallet friendly city helmet. Did you enjoy using the product? Yes! Would you recommend the product to a friend? I have done and will continue to. What do you do with all your 'test' lids? Sometimes they go back to the manufacturer/distributor but more usually the reviewer keeps it – not much you can do with a helmet that someone has sweated buckets in to. That does mean too that next time they do a helmet test they may well have a direct rival on hand for comparison. that looks weird. wouldn't fancy rocking that on even a commute when it's hot.